Chairman of the organizing committee, Dhallchand Seeram, Secretary Pedro Lazzari , Treasurer Ivalee Scott and other well-wishers thanked all sponsors for their generous contributions over the years. Mr. Walton is an awesome young man and a tribute to the Brac. Congratulations, and well done! 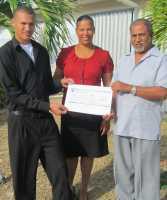 Rudy is indeed a wonderful young man; not only is he a tribute to Cayman Brac, but to his family as well. Congratulations Rudy. We are so proud of you!